Posted on Wed, Feb 29, 2012 : 11:30 p.m.
Pioneer's Tommy Pokorney, center, had a first period hat trick and four points total as Pioneer avenged two regular season losses with a 5-4 playoff win over Saline on Wednesday. 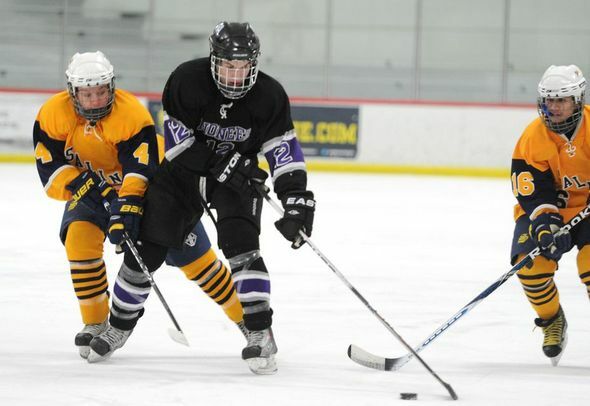 Forward Tommy Pokorney missed the Pioneer High School boys ice hockey team's first playoff game earlier in the week due to suspension. He wasted no time announcing he was back in the lineup on Wednesday, scoring three first-period goals for a natural hat trick against Saline. Pokorney would add an assist to his point total by game's end as Pioneer sustained a Saline comeback and held on for a 5-4 win at the Ann Arbor Ice Cube. “It was great because my mom just came to town to visit me, so I’m just happy I did when she was watching me,” Pokorney said. With the win, Pioneer advances to Saturday's Division 2 regional final to play the winner of a Thursday game between Okemos and Hartland. The Pioneers held a 3-0 lead after one period and just two-and-a-half minutes into the second period extended the lead to 4-0 on a Josh Packard goal off an assist from Pokorney. It was Pioneer's third power play goal of the night. Saline won both of the teams' meeting during the regular season, 5-1 in November and 7-3 just 11 days ago. “They came thinking that they were gonna walk all over us and we wanted to show them that we wanted it more,” Pokorney said. Pioneer's Tommy Pokorney scored three goals in under six minutes on Wednesday. But the game was far from over as the Hornets would answer with three consecutive goals of their own, including two just 13 seconds apart from seniors D.J. Aben and James Olson at the 12:04 and 12:17 marks, respectively. “We got away from our game plan and we let their forwards, who are outstanding forwards, attack the net and they’re good enough, they’re gonna score against you,” said Pioneer coach Paul Fassbender. Aben finished the game with two goals and two assists and Olson had a goal and two assists in the comeback effort. "D.J. 's always been the hardest working guy on the ice," said Saline coach Drew Denzin. "Our seniors have done it all year long. I'm proud of their effort." After allowing four goals in the first 19:28 of the game, Saline goalie Neil Flavin only allowed one more the rest of the way. Flavin finished with 23 saves. Denzin said he never considered pulling Flavin despite him giving up four goals on the first 15 shots he faced . "I knew (Flavin) gave us the best chance at winning," Denzin said. Going into the third period, Saline trailed 4-3 and had 14 seconds remaining on a power play. Pioneer would kill the penalty and take a 5-3 lead when CJ Bradburn snuck one past Flavin on the power play at the 5:05 mark. It was a goal that could have been avoided as Flavin tried to cover up the puck moments before the goal. One of his teammates however took the puck from under his glove and failed to clear the zone leading to Bradburn’s goal. Saline took another penalty shortly thereafter, but with 7:29 left in the game, Aben scored a shorthanded goal to keep their hopes alive. The Hornets had a few chances to tie the game late, but Pioneer goalie Spencer Peck stood tall and made the key saves. He finished with 25 saves on the night. Fassbender knows that missing his top two centers could present a problem Saturday night. The final will be played at the Cube at 5:15 p.m.
“Anytime you have to be strong through the middle and your top two centers go down, you’re calling on someone who isn’t used to that pressure,” he said. Thu, Mar 1, 2012 : 5:38 p.m.
Way to go Pioneer! Great win. Keep it going!